Food « Global Market Insights, Inc. The intelligent vending machine market has been expanding rapidly in recent times as technology continues to transform the world and disruptive technology is becomes the order of the day. For instance, recently, greenbox Robotics, a Southern California tech company, designed an intelligent vending machine that can dispense marijuana and CBD. The company’s chief motivation behind designing such a technology was the long queues in cannabis dispensaries. With the help of vending machines however, customers can cut the queue and buy products that include cannabis flower, extracts, edibles, CBD products and accessories. The machine even describes products and its effects and suggests products to customers. It verifies customer’s identification and determines age using facial recognition technology and accepts payment with either a debit card or Apple Pay. Intelligent vending machines have transformed many aspects of life and this machine aims to do the same for the cannabis industry. According to greenbox Robotics, the kiosk is designed to dispense multiple items in one transaction and streamline the purchase experience, bringing down a 30-minute wait down to nearly two minutes. Such an innovative vending machine is expected to be gamechanger for cannabis dispersion and the intelligent vending machine market in general. Vending machines have come a long way from their basic design and now are equipped to perform a lot more than dispense items and provide change. At present vending machines are designed to not only provide items requested but provide nutritional or other information about the items, interact with the customer to make suggestions about the purchase and even prepare fresh food. For example, in Italy a pizza vending machine called Let’s Pizza has been developed that prepares customized pizzas in less than 3 minutes. A window in the front allows customers to watch the flour being kneaded, the rolling of the pizza disc, spreading of the tomato paste and other ingredients and the finished creation baked in infra-red rays. The growth of the intelligent vending machine market is being driven by smart technology that brings together the convenience and availability of instant transactions with the tailored, entertaining and connected retail experience that customers have come to expect. Though U.S. has the most vending machines in the world, Japan has the highest density of vending machines with 5.5 million machines in 2016 that put one machine for every 50 people and is known for carrying more range of products that available anywhere else in the world. Fascination with technology, low crime rate, need for convenience etc. have driven the vending machine market in the country, but Japan being the pioneer of technology has presented the next step for intelligent vending machine market. Remarkably, the cashless, smart vending machines in Japan are enabled with face, eye, or fingerprint recognition as well as social media connectivity. In case a customer cannot decide between different options, vending machines are designed to scan faces to make a choice for them. For instance, face-scanning machines dispensing beverages use big data analytics and machine-learning and make a choice based on the age of the customer. If above 30 years old, it offers hot milk tea, green tea or orange juice while for younger customers it offers soft drinks as such preferences have been depicted by people of respective age groups. Observing the intelligent vending machine market trends and the future potentials for the technology, heavyweights from various industries have started to invest in the market besides adding innovative ways to help it grow. For instance, the Coca-Cola Company developed an intelligent vending machine that can recycle plastic bottles and cans. The VenCycling, as it is called, not only dispenses Coca-Cola drinks, but also accepts the used packaging besides performing other intelligent functions such as utilizing facial recognition and voice interactive system to make purchasing recommendations and making recycling a variety of Coca-Cola beverage packages more efficient. The machine also provides incentives to consumers who take the effort to recycle. Considering the fact that vending machines have come a long way from being basic product dispenser and that the Internet of Things, sensor technology, big data analytics and machine learning have brought a sea of change in how machines function, the intelligent vending machine market is expected to thrive over the coming years, gaining impressive traction and profits. This entry was posted in Sustainable & Smart Technologies and tagged Beverage, Food, Institutions, Intelligent Vending Machine Industry, Intelligent Vending Machine Market, Intelligent Vending Machine Market Report, Intelligent Vending Machine Market Revenue, Intelligent Vending Machine Market Szie, Intelligent Vending Machine Market Trends, Offices, Public Transport Hubs, Retail Sites, Tobacco, Vending Machines Market. The increasing deployment of sorting machines for improving plant productivity has been propelling optical sorter market share. The shortage of labor and surging need to handle more quantity of products in a less time are a couple of the most prominent causes behind the increasing deployment of sorting machines. In recent years, the optical sorter has emerged as one of the pioneering products to handle grains, pulses, spices, beans, rice, nuts, fruits, vegetables, and plastics. The capability of this device to sort the products based on their shape, color with high efficiency, excellent precision, and performance is poised to expedite optical sorter industry outlook considerably. The commitment of key players in the optical sorter market toward innovation, superior manufacturing, and intelligent design will have a notable influence on future product demand. Recently, the leading food sorter manufacturing company, TOMRA Sorting, Inc., has revealed its plan to launch innovative sorting machines at Pack Expo. TOMRA has been working to resolve customer issues with its new product launches to enhance its customer base. With this recent launch, it seems to have resolved the issues pertaining to the food processing companies that had been struggling earlier to filter out foreign materials like stones, wood, metal, glass, and plastics from vegetables and potato products. The company claims that the newly developed machine will filter 98% of all types of filtering objects. The incidence testifies that the innovative capabilities of the companies to fulfil the customers’ needs with their high standard products is likely to stimulate the optical sorter market share from the food industry over the years ahead. The advent of next-generation technologies such as the Internet of Things (IoT), and Artificial Intelligence (AI) also has augmented the product development strategies of optical sorter industry contenders. Considering the ease of use of technologically advanced sorting equipment, several end-users have been deploying sorting machines on a large scale. For instance, in the middle of 2018, the UK based waste management company, Viridor has invested nearly 445,000 pounds to upgrade its plastic processing facility with the deployment of the robotic sorter. This robotic sorter can be utilized to purify PET plastics by filtering metals and other kinds of contamination pertaining to the integration of AI-powered vision systems. Speaking along similar lines, in order to resolve the issue of the labor shortage, U.S. based Diamond Fruit Growers has recently invested to deploy its first ever optical sorting line specially designed for pears. The Italian company, Unitec has also engineered an optical sorter with the integration of software that can minimize the damage by sorting out fruits based on their grade and size without scuffing. The use of such machines to handle a plenitude of products at the food processing facilities will help companies to handle more volume with less labor. 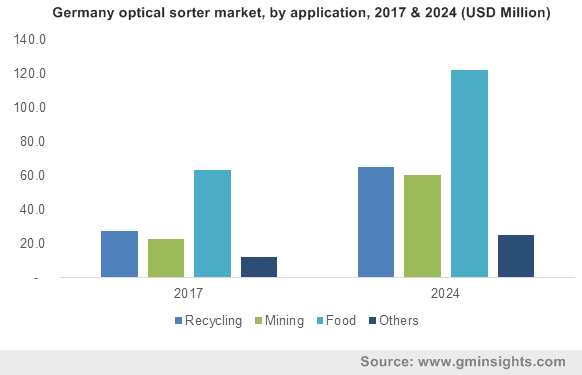 Continuous investments in technology by prominent end-users to handle a large volume at a time is likely to propel optical sorter market trends. In addition to food processing, the mining sector is a pivotal revenue generating ground for optical sorter market players that have been incorporating new features into existing models. They have also been enhancing the design features of the products to improve its wear-resisting capability and ease of maintenance. Taking into account the extended life cycle of the products, most of the mineral and metal ore extraction industries have been deploying modern optical sorters on a large scale which will have a positive influence on the market growth. For the record, in 2017, the mining industry held a 15% share of the optical sorter market. Growing availability of highly advanced product ranges will propel the optical sorter industry outlook over the years ahead. In addition, increasing awareness among the end users about the cost-effective returns obtained from the automated processes at the workplace will also have a notable influence on the product demand. For the record, by the end of 2024, optical sorter market will surpass revenue collection of USD 3 billion. This entry was posted in Sustainable & Smart Technologies and tagged Belt, Cameras, Food, Freefall, Hybrid, Hyperspectral Cameras, Lane, Lasers, MINING, NIR Sorters, Optical Sorter Market, Optical Sorter Market Share, Optical Sorter Market Size, Optical Sorting, Recycling. The remuneration graph of U.S. municipal solid waste management market has witnessed a phenomenal escalation in the past decade, owing to myriad economic & environmental advantages of effective waste management. 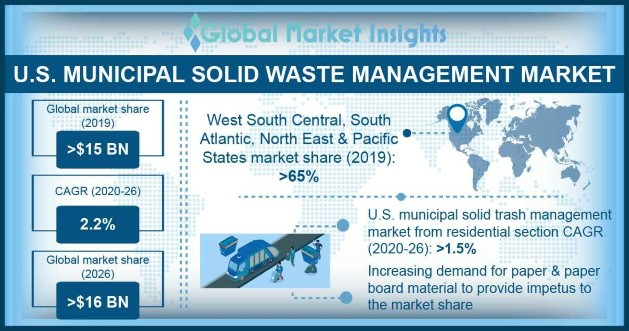 The burgeoning challenges of solid waste due to tremendous surge in the population in the United States have further compelled the industry players to bring forth innovative, sustainable, and cost-effective approaches of MSW across the country. It has been reported that in general, the waste generation is higher during the strong economic growth of the country and therefore effective solid waste management network forms a significant factor driving the GDP. Reliable reports claim that the United States produced more than 250 million tons of municipal solid waste in 2014 – a significant high and approximately 4.4 million more than generated in the year earlier. It was further reported that the around 66.4 million tons of waste was recovered for recycling in 2014. Despite the tons of waste to handle, it was not until recently that the sanitation agencies took upon themselves to handle recycling and monitor third-party contractors. The U.S. Environmental Protection Agency in this regard has been encouraging the regional regulators and governmental agencies to make efforts in assisting the upcoming solid waste management scenarios, to ensure proper storage, disposal, segregation, and recycling processes. Recently for instance, Atlanta regulation agencies has deployed smart phones with waste management application in over 89 sanitation trucks & other vehicles as part of a MSW management pilot program. The use of the application to track truck routes lead them to evenly distribute and take efficient routes to the appropriate landfills and recycling facilities. With further governmental norms encouraging sustainable trash management, New York recycling & composting municipal solid waste management market is another lucrative region garnering hefty proceeds. Estimates claim the U.S. MSW management industry from New York to exceed a valuation over USD 450 million by 2024, owing to the influence of region’s rising population base residing in the urban areas and flourishing tourism industry leading to growing investment in waste management infrastructure. Further speaking of the expanding governmental investment in waste management, the U.S. President Donald Trump, recently signed a legislation committing the country to expand its efforts to clean and manage around 8 million metric tons of litter such as plastic, paper, and electronic waste polluting the oceans. Currently, recycling & composting solid waste has gained immense traction, given the advancement in waste reprocessing and trash conversing technologies. Recycling the waste to convert it into reusable material is significantly helping MSW management agencies in reduced consumption of raw materials and energy usage as well as lowered water & air pollution. The process is further gaining momentum and managed to accumulate over USD 6 billion in 2017, because of the introduction of strict & rigorous anti-dumping laws by both the state & federal regulators and development of recycling approaches for sustainable economic status. For instance, the University of Minnesota has initiated a recycling drive under which it will be recycling more than 3,800 tons of recyclable materials that constitutes more than 40% of the total waste generated in the campus. In addition to expanding recycling & composting services in the U.S. municipal solid waste management market, it is noteworthy to mention that the paper and paperboard trash accounted for a considerable 26% market share in 2017. Rapid progress of the packaging industry coupled with rising application of recycled paper and paperboard are expected to drive demand. These above-mentioned trends significantly shed light on the progressive outlook of the U.S. municipal solid waste management market in the recent years. However, it wouldn’t be wrong to say that China’s ban on import waste has rocked the global solid waste management and recycling industry to gear up for managing their own waste and recycling efforts. It remains to be seen that how the U.S. municipal solid waste management industry will cope with the sudden change in policies as these new accumulating waste loads incur increasingly high rates in managing and recycling waste. Nonetheless, experts believe that as the export market for waste product dries up, the U.S. municipal solid waste management industry will be seen desperately recovering, recycling, and reducing the waste, while surpassing the overall remuneration portfolio of over USD 25 billion market by 2024. This entry was posted in Sustainable & Smart Technologies and tagged Combustion, Commercial, Composting, Food, Glass, Incineration, Landfill, Metal, Municipal Solid Waste Management Market Overview, Municipal Solid Waste Management Market Size, Paper, Paperboard, Plastics, Recovery, Recycling, Residential, U.S. Municipal Solid Waste Management Market, U.S. Municipal Solid Waste Management Market Industry, United States Municipal Solid Waste Management Market Statistics, Wood, Yard Trimmings. The global anisole market is projected to experience an accelerated growth over 2018 – 2024, primarily fueled by organic chemical compound’s applications in the rapidly expanding pharmaceutical and cosmetics sectors. 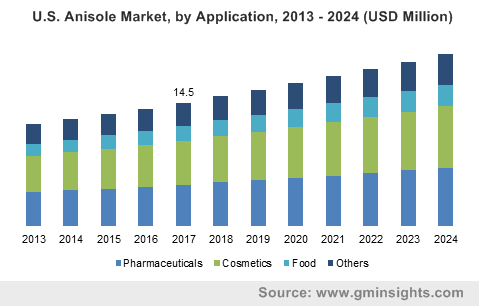 Estimated to be valued at over $77 million, the global anisole market has depicted considerable growth due to the product’s rising incorporation in a plethora of cosmetic products, on account of the artificial fragrance that is associated with anisole. It is prudent to mention that anisole is also used to manufacture several different chemical compounds that find applications across a slew of application verticals. However, pharmaceuticals and cosmetics are among the biggest and the fastest growing application sectors that are not constrained by the burden of serving only a niche demographic – which is the reason why these sectors are thriving in some of the most populous regions of the globe, gradually aiding the growth of anisole market as well. The Asia Pacific is one of the most lucrative regional anisole markets, that is popularly driven by the rise in demand for cosmetic brought on by the increased disposable incomes and the subsequent affordability in the region. According to a 2017 report by the French personal care and cosmetics company – L’Oréal S.A., the firm’s accrued almost 24% of its global sales in 2017 from the Asian belt. This can be undeniably attributed to the rising demands for premium cosmetic products due to the rate at which the discretionary expenditure skyrocketing, especially across the economies of India and China. It is also prudent to mention that APAC anisole market has also received commendable boost on account of the product being used as a pesticide, in the agro-based economies, wherein governments have been attempting to readdress pivotal issues in the agricultural domain. For example, the Indian government has brought about initiative such as Pradhan Mantri Fasal Bima Yojana and Paramparagat Krishi Vikas Yojana in order to reform agricultural production, The government of China has also shifted its focus toward agricultural reformation. These initiatives have led to an escalation in the demand for pesticides, that would gradually help augment the regional anisole market trends. Driven by the efforts across the economies, APAC anisole market share is likely to soar in the years to come. As per Global Market Insights, Inc., the APAC region accounts for 30% of the global anisole market share. Apart from the cosmetic applications, the global anisole market would also be receiving a significant boost from the pharmaceutical sector. The U.S. pharmaceutical sector has been the most flourishing domestic market for the development and commercialization of different pharmaceuticals. According to a report by PricewaterhouseCoopers (PwC), primary pharmaceutical markets such as Europe, North America and Japan had been under considerable pressure a decade back, having experienced a slowdown in growth. Today however, the pharma sector has witnessed considerable incline across the developed as well as developing economies, thereby making the domain a lucrative growth avenue for the global anisole market. Anisole industry share from pharmaceutical applications is expected to witness a CAGR of 4.4% over 2018-2024, driven by the fact that the product serves as a crucial precursor in producing a plethora of pharma compounds. For instance, 4-methoxyphenol, a phenol derived from anisole is used to create 4-methoxyphenol – a chemical used in manufacturing of bulk pharmaceuticals like Raloxifene and Dextromethorphan. It is imperative to mention that global anisole market growth is slightly hampered due to the small amounts of anisole required for cosmetics products. For instance, according to a study by the American College of Toxicology, p-Hydroxyanisole, a phenol derived from anisole is used as an antioxidant in different cosmetic products in concentrations as low as 1% because the organization recommends that smaller concentrations would not result into it being a severe irritant. Nonetheless, despite anisole and the anisole-derived phenols being used in small quantities and dilute concentrations, the compounds are still expected to be incorporated in a plethora of cosmetic products worldwide, thereby augmenting the commercial landscape of global anisole industry. As per Global market insights, Inc., anisole market size is projected to cross $100 million by 2024. This entry was posted in Bulk & Specialty Chemicals and tagged Anisole Market, Anisole Market Forecast, Anisole Market Report, Anisole Market Research, Anisole Market Share, Anisole Market Size, Cosmetics, Food, Pharmaceuticals, Purity. The global metallic stearate market has been the recipient of several mergers and acquisitions lately, owing to the remarkable upsurge in the requirement of various metallic stearates. Companies partaking in this vertical, it has been observed, have now been looking forward to enhancing their regional reach by investing in capacity expansions as well. The overall growth of the metallic stearate industry however, can be aptly attributed to the rising product demand across the cosmetics, plastics & coatings, and food industries. In line with the surging product demand, companies have been adopting newer growth tactics to sustain in the competitive business space and consolidate their stance in the industry. The increasing health hazards pertaining to the prevalence of a sedentary lifestyle have been resulting in the occurrence of numerous chronic diseases. Driven by the same, in tandem with the ever-changing diet consumption patterns and lifestyles, a rising trend of health consciousness has been observed among the masses. Consumers have found myriad ways to enhance their diet, one of which is consuming dietary supplements in the form of liquids, powders, capsules, and varieties of tablets. In this regard, many healthcare producers and food manufacturers have been formulating a new range of essential supplements. However, the increasing concerns about the shelf life and reducing nutrition value of the products a period of time have led to the requirement of metallic stearates. In fact, various forms of sucrose, glidant agents, starch derivatives, and lubricants comprising magnesium stearate and stearic acid have been used to hold nutrients and maintain uniformity in dietary supplements, which would gradually propel metallic stearate market share over the ensuing years. In 2017, leading specialty chemical manufacturing company, Peter Greven disclosed its plan to extend its reach across U.S. with the acquisition of Norac Additives LLC. This acquisition will help the German oleochemical producer to strengthen its position in North America metallic stearate market pertaining to the value addition to its plastic additives and metallic soaps manufacturing portfolio. Reportedly, with the ever-increasing economic development and surge in the investment in healthcare infrastructure across U.S., this German company will gain commendable benefits ahead in metallic stearate market. In another instance, a leading player in the metallic stearate market, Valtris Specialty Chemicals has acquired Akcros Holdings Limited in 2016. Akcros is one of the well-known suppliers of chemical additives for processing and production of paints, coatings, and polymers mainly across North America and Europe. This strategic acquisition has opened multiple new avenues for the company with the addition of different product ranges and a highly versatile customer base. In fact, this specialty chemical manufacturer, with this acquisition, is touted to strengthen its market position in North America as well as Europe metallic stearate industry. Moreover, Akcros is also well-known for its excellent R&D capabilities and product offerings that will also prove to be fruitful for Valtris to improve its future prospects. In 2015, Univar USA Inc. purchased 100 percent stakes of Chemical Associates Inc., which prominently manufactures and distributes metallic stearates, calcium stearate, stearic acid, and many other chemical products. Through this acquisition, Univar had been touted to bring additional value to the firm’s pivotal markets such as food, personal care, sanitation, lubricants, adhesives, coatings, and cleaning. The on-going strategic involvement of companies in the enhancement of the existing product portfolio and the extension of their regional reach is slated to generate profitable business opportunities over the years ahead. The rise in the manufacturing capabilities of the companies over the last few years will also remarkably fulfil the increasing product demand. 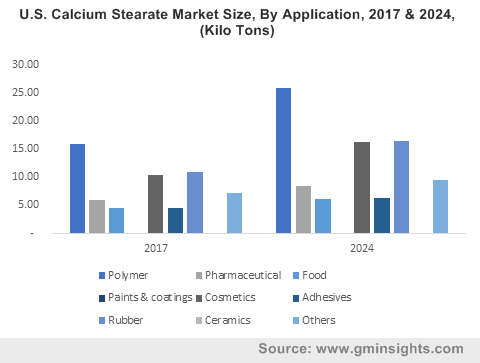 For the record, the overall metallic stearate market size is anticipated to cross a respectable revenue collection of USD 7 billion by the end of 2024. This entry was posted in Bulk & Specialty Chemicals and tagged Aluminum stearate, Calcium stearate, Ceramics, Construction, Cosmetics, Food, Global Metallic Stearate Market, Lithium stearate, Magnesium stearate, Metallic Stearate Market, Metallic Stearate Market Research, Metallic Stearate Market Size, Paint & Adhesives, Pharmaceutical, polymer, Rubber, Sodium stearate, Zinc stearate. Growing emphasis on consumer satisfaction and safety has proliferated the testing, inspection, and certification (TIC) services market as governments worldwide have implemented stringent quality regulations on almost every industry vertical. Whether it is construction, automobile, energy, healthcare or other segments, continuous advancement in products and components have necessitated upgraded testing and certification requirements. Improvements in management, product quality, manufacturing processes, supply chains and service value have become imperative for the growth of any business, imposing a need for the TIC services market. Existence of recognized certifications such as ISO:9001 or ISO/TS 16949 make it easier for customers to search for companies that provide excellent product quality, better customer service and new, innovative solutions. 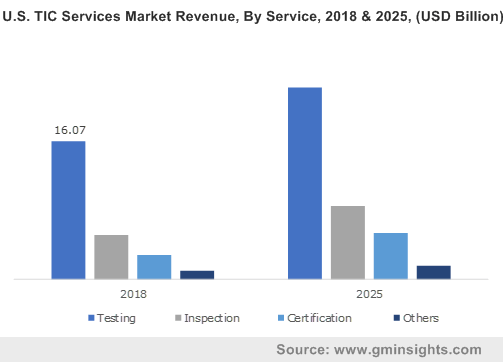 The global TIC services market valuation in 2017 stood at over USD 150 billion, driven by the obligation of companies towards meeting specific product requirements and to comply with international quality standards. Besides helping to control the quality, effective testing and inspection processes aid in minimizing rejections, reduce manufacturing costs and identify reasons for a defective output. The transportation segment, in general, constitutes a major part of the global manufacturing industry where thousands of components or auto parts go through daily quality checks. As governments and international agencies are constantly raising the weight, material and other standards of automobile components to enhance the safety and efficiency of vehicles, the TIC services industry is subsequently gaining massive popularity. OEMs as well as small auto component vendors are striving to achieve high level of quality and get certified, to get documented and provide validity to their proficiencies and expertise. Frequent inspection and evaluation of manufacturing processes by in-house or third party services to maintain a grip on the quality level will continually boost the TIC services market. As per estimates, the EU alone produced over 17 million passenger cars and 2.6 million commercial vehicles in 2017. With strict regulations in place to enhance the fuel efficiency of future vehicles and reduce carbon emissions, the TIC services market will experience tremendous growth from testing and inspection of advanced auto components and manufacturing processes. New processes need to be sufficiently tested before implementation and vigorously inspected for any faults or defects to ensure product uniformity. 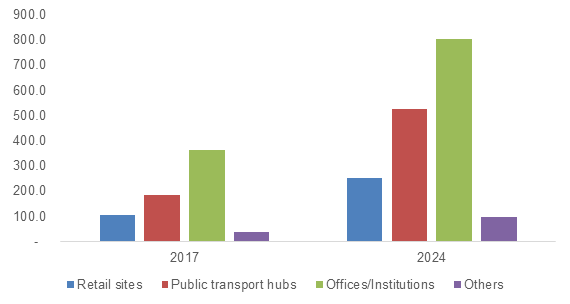 Globally, an emerging product line in the automotive sector is connected and self-driving cars, which presents a challenging task for the TIC services industry. Chipmakers and testing companies are helping to develop these products by adhering to ideal temperature, voltage, electromagnetic interference and several other standards put down for an efficient autonomous system. Automotive standards like ISO 26262 have been introduced related to the safety of electrical and electronic systems within vehicles, warranting adequate testing and inspection to be done on advanced automotive chips. The TIC services industry is rapidly witnessing demand from the healthcare and life sciences segment, with test and inspection reports of pharmaceutical equipment being critical in assessing whether the international standards are met. TIC companies are trying their best to evolve with technological developments and remain up-to-date with new regulations pertaining to safety and quality. Products, apparatus and supply chains are subject to quality testing activities regularly, as pharmaceutical companies are responsible for providing vital therapeutic solutions. Even other parties involved in the supply chain must go through intense inspection by assigned representatives to be eligible to acquire critical certifications. Citing an instance that signifies the importance of the TIC services market, Swiss WorldCargo recently received IATA’s Center for Independent Validators (CEIV) Pharma certification, which encompasses not only the airline but also the entire organization. To elaborate, a CEIV Pharma certification indicates that the lifesaving pharmaceutical products are being handled in compliance with the best global standards of safety, security and efficiency by the certified party. With this certification, Swiss WorldCargo has attained a milestone which only a small number of airlines have been able to earn, recognizing them as globally consistent in exhibiting high quality standards while handling pharmaceutical products. Further, U.S. based Nu-Med Plus Inc. has established a quality management program and trained its employees regarding quality standards in an effort to gain ISO 13485 certification. The certification is essential for the company before it files for the approval of its new nitric oxide delivery devices with the FDA and demonstrates the significance of the TIC services market in forming the image of a top-quality healthcare product or service provider. Overall, the TIC services industry will undergo remarkable transformation due to incessant developments in the life sciences field, resulting from the existence of rigorous certification eligibilities in healthcare and mandates that demand high quality control. Slated to record a 6% CAGR from 2018 to 2024, the TIC services market is highly dispersed with key players like Intertek, SGS SA, Bureau Veritas, DEKRA, TUV SUD, Apave and Eurofins being the major participants. This entry was posted in Sustainable & Smart Technologies and tagged Agriculture, and Certification Market, and Certification Services Market, Certification, Chemical, Construction, Consumer Product, ENERGY, Food, Gas, Global Testing, In-House, Inspection, Life Science, MINING, Oil, Outsource, Service, Testing, TIC Market Companies, TIC Services Market Overview, TIC Services Market Size, TIC Services Market. TIC Market, Transportation, Type. In the recent times, sodium acetate market has witnessed a rather lucrative commercialization prospects owing to its extensive application across numerous business verticals including food processing, leather and textile, and pharmaceuticals. Prominently utilized as a food preservative, sodium acetate has further found widespread usage as a neutralizing agent, diuretic agent, and buffering & pickling agent across various end-use domains – a factor that has contributed significantly toward sodium acetate industry share augmentation. Moreover, rapid industrialization and enormous FDI investment in emerging nations across the globe has spurred the growth potential of the aforementioned industry verticals, which has, in turn, driven the sodium acetate market size expansion. Owing to its excellent food preservation qualities, sodium acetate has been increasingly preferred by food processing industry over the past decade, which has proved to be quite beneficial for the overall sodium acetate market. The widescale applicability of this chemical can be attributed to the massive rise in the consumption of canned food items subject to fast-paced lifestyles and a drastic variation in dietary habits across developed and developing countries. This has, in consequence, provided a significant boost to the growth potential of sodium acetate industry. Apparently, sodium acetate is being utilized as an acid regulator to prevent the growth of harmful bacteria in canned meat, vegetables, and fruit. Furthermore, it would be prudent to mention that the addition of sodium acetate during the canning and drying procedures not only desists bacterial growth but also extends the shelf life of the product. Concurrently, sodium acetate market has found a major foothold in the global dairy sector, as the chemical is being utilized as an emulsifier and preservative in numerous dairy products. Apart from being widely used in condensed milk, sour cream, buttermilk, whey-based yogurts and drinks, sodium acetate has emerged as a preferred preservative in cheese preparations such as processed cheese, ripened cheese, cheese analogues, and processed cheese. In view of the rapid advancement of the global dairy sector, the growing prominence of sodium acetate as a preservative in the overall dairy industry is likely to impel the sodium acetate market size expansion. Thus, the rising significance of sodium acetate in the global food processing sector can be validated from the aforementioned declarations. In fact, as per the research report compiled by Global Market Insights, Inc., food processing vertical accounted for more than USD 26 million of the revenue share of the total sodium acetate industry size in the year 2016. The Asia Pacific region has indeed established itself as a profitable growth terrain for sodium acetate market stakeholders, as the expansion of numerous end-use verticals in this region has been much more pronounced when compared to other developing economies. For instance, sodium acetate is regarded as one of the most popular preservatives in Japan with the total demand for the chemical, as per reliable sources, being a humongous 3,500 tonnes. Apparently, such statistics demonstrate the necessity of sodium acetate across various verticals in the Asia Pacific region. For the record, Asia Pacific sodium acetate industry is estimated to have apportioned more than 55% of the total revenue share of this business space in 2016. Elaborating further, it is quite imperative to mention that this multimillion-dollar business sphere is set to exhibit robust growth rate over the forthcoming years owing to the humongous deployment potential of sodium acetate – right from modest domestic uses to intricate chemical and industrial applications. In addition to this, the leading sodium acetate industry participants have been investing massively in vital research and development activities to strengthen their position in this swiftly emerging bulk and specialty chemicals vertical. 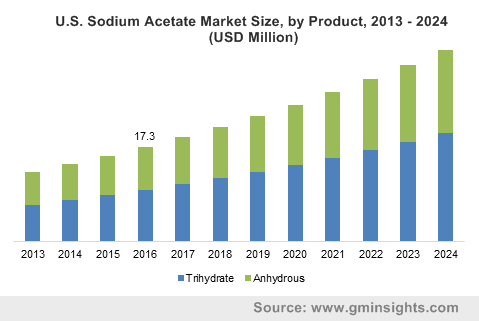 Apparently, considering the aforementioned aspects, it quite undeniable that the sodium acetate market growth prospects appear to be substantially profitable in the ensuing years, with a target revenue of USD 220 million by 2024. This entry was posted in Bulk & Specialty Chemicals and tagged Anhydrous, Food, Leather, Medical, Pharmaceuticals, Sodium Acetate Market, Sodium Acetate Market Report, Sodium Acetate Market Share, Sodium Acetate Market Size, Textile, Trihydrate.